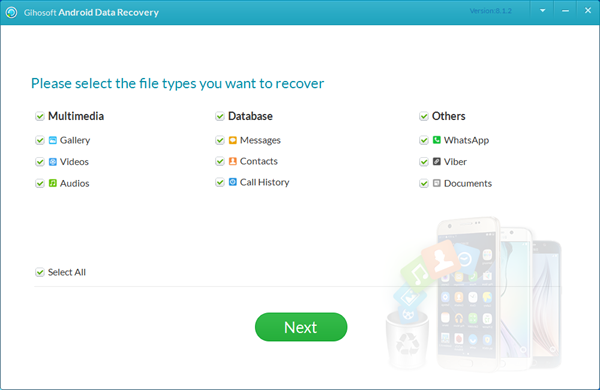 Gihosoft Android Data Recovery for Mac is a powerful Android file recovery software that enables you to recover accidentally deleted or lost Android photos, music, videos, messages, contacts, call logs, WhatsApp messages, Viber chat history and so forth on Mac computer effortlessly. 5.Features with in-depth data scanning technology and powerful anti-deletion capabilities. No matter your data is lost for whatever reason, you can quickly get them back with this software. 7. It’s free to try. You can try the free trial version before purchase, and even after your purchase, we offer a 30-day money back guarantee. Last edited by Iris Cheng; 06-19-2018 at 02:18 AM. If you want to recover deleted data from Android on mac, the easy way is using a pro Android data recovery software for mac. After connecting android to mac, start the software. A short time scanning later, all deleted data will be scanned out and recovered to mac. If you want to find the Mac version Android Data Recovery, I recommend you Aiseesoft FoneLab for Android. It is the best Mac Android Data Recovery. It can scan your phone and SD card deeply to find the deleted data on it. You can preview them and then get back any of them from your Android phone. It can recover deleted text messages, photos, videos, contacts, call logs, Whatsapp messages, music, books and other document files from your Android phone on Mac.